When thinking about the market value of your home it’s important to take emotions out of the decision and focus on the items that do affect the market value of your home. These nine items may help you fall in love with your home but really have no bearing on the market value your home has. 1. What you have in it. The things you have in your home really have no bearing on the market value unless you have them convey with the house. As lovely as your furniture is it provides no market value to the home. 2. What you need out of the sale. The market value has nothing to do with what you may need from the sale of your home. This is sometimes a difficult thing to understand, especially if you’re selling because of financial need. The market only cares about how the home compares to other homes currently sold on the market. It is not the market’s job to worry about what you’re going to get out of the sale. 3. What you want out of the sale. You may want to move to a smaller home. You may want to relocated closer to your work. The market doesn’t care – it cares about the value of your home. 4. What is appraised for. Yes, the appraisal is important, and the buyer will not get full lender approval without the appraisal coming in at the right price, but just because a home appraises at a certain price doesn’t mean a buyer is willing to pay that price. 5. What you heard your neighbor’s house sold for. Yes, to determine a price your REALTOR® will use comps from the neighborhood to determine the market rate – but that may not include your neighbor’s house. Depending on when your neighbor sold, what their personal financial situation was, and the condition of their house determined how much they earned after the sale. You can’t directly compare that with your home sale. Instead focus on what your home is worth today in today’s market. 6. What the tax office says it’s worth. The local government will put what is known as the tax assessed value on the property – this is how they determine how much to charge you for the property tax. This number as little to do with the market value of your home and should not be used as a guide for pricing your home. 7. How much it is insured for. This will change based on the needs of the homeowner – and it will have no bearing on home buyers. 8. The memories your family shares at the home. There is no way to quantify the memories your family has created in your home, and while you can use them to create a good narrative to sell your home it will not affect the over all market value of the home. 9. The price of the home where you are moving. The buyer will not care about where you’re moving to – their job is to get the house at the lowest price possible. Your job is to sell it at the high price possible – this is why you need to concentrate on price the home well, staging it to sell, and finding the best REALTOR®. 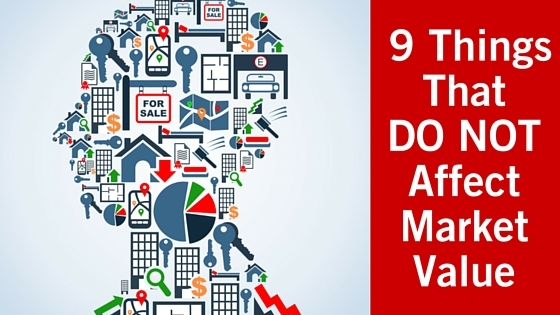 What Determines the Market Value of a Home?